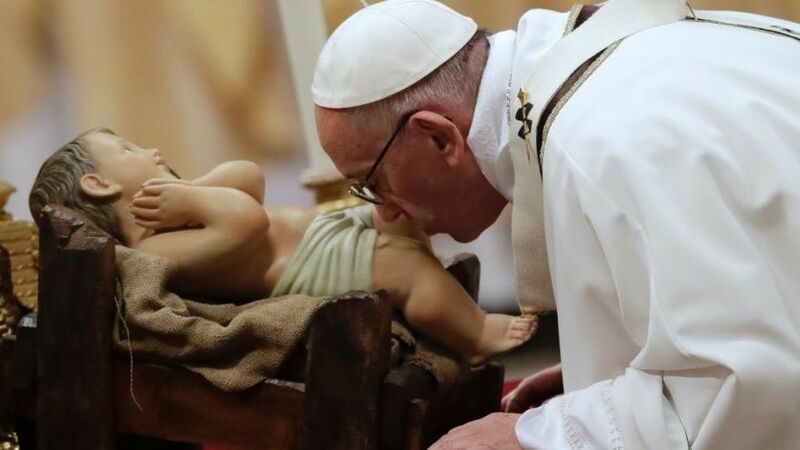 During a high-security Christmas Mass at the Vatican, Pope Francis has said that the true meaning of Christmas is being drowned out by materialism. The Pope also denounced the continuing suffering of children. The head of the Roman Catholic Church mentioned those who faced hunger, danger on migration routes and bombing in Syrian cities such as Aleppo. Those taking part in Christmas Eve service inside St Peter’s Basilica had to pass through metal detectors. The Mass celebrating the birth of Jesus Christ is the first major event of the Christmas season for the Pope, which will include his noon blessing on Christmas Day. During the service, Pope Francis said Christmas had been “taken hostage” by materialism, and that the season needed more humility. The pontiff said people now lived in a time “when the lights of commerce cast the light of God into the shadows, when we are concerned for gifts, but cold toward those who are marginalized”. Throughout the past year, Pope Francis has urged compassion towards refugees, urging Christians to remember that Jesus himself was a migrant.